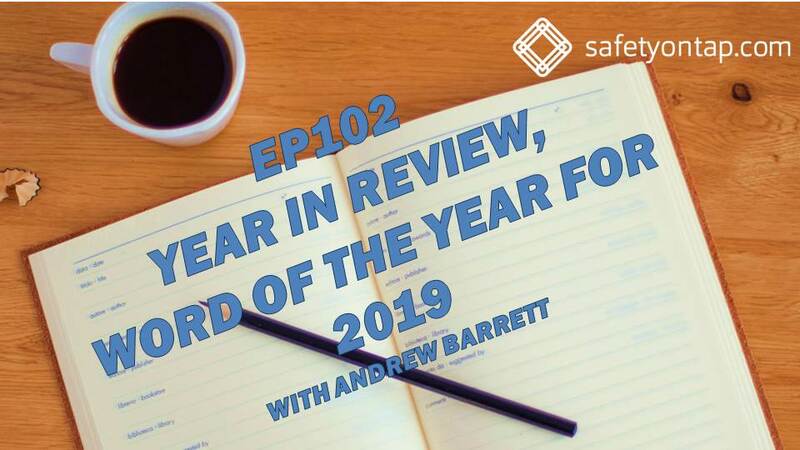 Listen in to this episode for my very brief year in review, my word of the year for 2019, and why any of that is actually relevant for you. The reason why I share some reflections on the year that was, and my word for the year that is ahead, is not because that has any specific relevance to you. But don’t switch off, just yet anyway. The reason why I share this with you is because I encourage you to go through a similar process. This podcast is for leaders, who want to grow themselves and drastically improve health and safety along the way. That’s you. We cannot grow to our fullest extent, unless we have a practice of reflection. That is a habitual, and structured approach to thinking about what has happened in the past, and what we can learn from it for the future. I’m sharing with you in the hope that you might feel the value that reflective practice has, with me as an example, and that you might also benefit for your own reflective practice. On that note, if you want to join the dots about this episode and some others which related, check out episode 3 and 23 with Tim Allred, both on reflective practice. And if you want some more background on my 2018 word of the year, and how I started 2018, check out episode 74. Abundance was my word of the year in 2018. Interestingly, as has become my habit since then, I did not go to the dictionary definition of the word to help inform how we might understand what it means. So, what is the common meaning? Abundance is a very large quantity of something. Apparently. I was really quite taken aback by that definition, because I thought I had ascribed some kind of meaning to this word which it doesn’t have, which I was critical of in episode 102 when I suggested that the word harmony had been misappropriated by anyone who wasn’t talking about music. Maybe I’m nerding out a bit too much on words. But words matter, their meaning matters. Instead of mere volume of something, he kind of abundance I was talking about was characterised by two things. First, that it was a richness of things in life, which is where the idea of abundant life, which you can Google yourself, is a closer description of what I was trying to channel when I chose the word abundance. And second, that abundance is both and invitation and a challenge for us to give first, not focus on receiving or building our own abundance. To offer, abundance, to create it in the world. To be generous with our time and ideas and stuff. It occurs to me that abundance is not something that happens magically, or randomly, as in some people are lucky to have an abundant life and others are not. I’m sorry to say that in my reflection, abundance is something you receive as a gift because you create it for others. My commitment, and my encouragement for you in episode 74 at the beginning of 2018, was to give to get. To pay it forward. To be generous with what you’ve got, which most of the time costs you almost nothing. A focus on an abundant life really helped me get clear and intentionally about my time and energy and money and stuff, and just because the year has changed and I’ve chosen another word to guide me in 2019, doesn’t mean it wont continue. In fact, I still have a lot of work to do with my health, and my parenting in particular. And as for Safety on Tap and my work, for those of you who have listened to episodes 100 and 101, you know that there is even more I am trying to give, to put out in the world in the hope that we can all grow more, grow better, grow faster. I was really pleased to hear of two listeners to Safety on Tap who have themselves chosen words for 2019. I was pleased not because it’s something that reinforces my own worldview nor because I can take any credit for their own reflections – I am pleased because I know the power of reflective practice, and understand what they have gone through to arrive at their words. It’s really cool. Christine chose the word ‘challenge’, and was brave enough to share her reflections on choosing that word on Linkedin, which I thought was superb, and another listener got in touch to share with me what they were focussing on this year. Bring social and experiential learning together like that is a very clever thing to do. I’d love to hear from you if you have a reflection on 2018, and a focus for 2019. So on to this year, 2019. If you’ve been listening for a while, I’d like to think that there are a few words you might use to describe the frequent themes, ideas or philosophies inherent in my work and the Safety on Tap community. Words like leaders. Growth. Improvement. Learning, with emphasis on the 702010 concept of learning (which you can hear more about in episode 36). Reflective practice. I’ve also been asking for feedback, or getting it unsolicited which is actually quite nice. Energy comes up time and time again. The energy I bring, the energy I share, and help to create when I’m with people, including you listening to this podcast. That was a nice surprise for me, not because it’s from left field, but because I’ve never been conscious or intentional about my energy – it just is what it is. But being full of energy is not something you or I can do all the time, I think of energy as something which you have the potential for, kind of like a battery. If you don’t connect the battery to something, you don’t see or experience the energy – and over time it will reduce, it discharges. But we aren’t simple mechanical power devices, our energy is something that builds and feeds off how we think, what we do and the people we hang out with. It seems like energy has been an important part of my abundance life in 2018. And my focus in Safety on Tap hasn’t changed, though what we do and how we help you will continue to change over time. 2019 (and a few years after that actually) for me also brings a new challenge, working in a leadership position in health and safety in the agriculture and fishing sectors in Australia. Check out episode 98 in which I share with you what I’m doing and why I’m taking on that challenge. That context, agriculture and fishing, quite literally is about growing – growing food and fibre. Bringing all these things together, growth in the personal and professional sense, and the agricultural sense, what I’m already so committed to in Safety on Tap and to improving that, and a refinement of what I learned in 2018, my word for 2019 is flourish. I want to flourish in 2019, and I want to help you to as well. Flourish,(of a living organism, like humans) grow or develop in a healthy or vigorous way, especially as the result of a particularly congenial environment. Flourish, to develop rapidly and successfully. Flourish, to wave (something) about to attract attention. I shared with you in episodes 100 and 101 some of the new things we’ll be doing this year to help you flourish. I’m really excited to experiment and have fun with you doing that. We have even more quality interviews, my reflective episodes, and new case study and coaching conversation podcasts. Whether you are talking about a word of the year, or a vision, a mission, a purpose statement, a strategy, any number of things. The words aren’t nearly as important as the meaning you give them, the story you engage others in about these words, and the action you take guided by or consistent with these words – that’s what matters. I hope you permit and commit yourself to flourishing in 2019. I hope you create the time and space to reflect on your year past, and year ahead, and you formulate either on your own or with the important people around you, what you’ll be guided by and strive for this year. I hope you attract the attention you seek, in a good way, because you are flourishing. And until next time, I hope you take positive, effective or rewarding action, to grow yourself, and drastically improve health and safety along the way! Seeya!